I have tried to refrain from comment on the Brexit referendum vote until the situation had settled down a bit. Now that the campaign is in full swing, it`s time to consider how the markets might react as we approach the June 23 vote. First, the economy, and whether positives like free trade would exist outside of EU membership, and whether negatives like excess regulation would make a meaningful difference if removed. Second, migration of workers, and whether this helps offset Britain's poor demographics, or acts as an excess strain on the welfare system. And third, sovereignty; is Britain ruled by the members of Parliament in Westminster elected last May by British voters, or by unelected bureaucrats in Brussels? In the last few weeks, I have been highlighting the improving macro-economic and fundamental backdrop, while voicing concerns over the technical damage suffered by the stock market. I had concluded that the market was undergoing a W-shaped choppy correction. Last week brought a number of reversals. The macro and fundamental picture suffered a number of setbacks, which creates a number of longer term concerns. On the other hand, a review of the technical conditions showed considerable improvement. Mid-week trading update: This morning started off well for the bears - until oil prices began to rally. I wrote on the weekend that while my inner investor was constructive on stocks, my inner trader still believed that downside risk remained. Those views are unchanged. What’s the bull case? The positives are this: no one is articulating a bull case for US equities with conviction. Earnings expectations are potentially low. There is some fiscal stimulus this year (vs. drag previous years). The Presidential candidates don’t appear to be multiple expanders now, but they will get more centrist and the riffraff will be removed in a few more weeks. Sentiment is low (two weeks ago an investor on a panel we moderated said “It is a multi-variable world and every variable is negative”.) The US probably looks relatively better than other parts of the world. So maybe, the bull case is just that no one can articulate a bull case. If Parker had read my commentary last weekend, he would have understood the bull case (see Profit by thinking like Big Money). To put it very simply, the bull case for stocks can be summarized in two words: "Growth surprise". Regular readers recognize that my inner investor is bullish on stocks, though my inner trader remains a little leery and expects further market choppiness (see Profit by thinking like Big Money). Despite my longer term bullishness, I tweeted this morning that I had tactically taken a small, underline the word "small", short position in SPX in my trading account. The technical structure of market action is a bearish structure. Worried about a Chinese devaluation and currency war? Our research suggests that China does not have the financial arsenal to continue on without restructuring many of its banks and undergoing a large devaluation of its currency. It is normal for economies and markets to experience cycles, and a near-term downturn that works to correct the current economic imbalances does not qualitatively change China’s longer-term growth outlook and transition to a service economy. However, credit in China has reached its near-term limit, and the Chinese banking system will experience a loss cycle that will have profound implications for the rest of the world. What we are witnessing is the resetting of the largest macro imbalance the world has ever seen. Then on the weekend, PBoC Governor Zhou Xiaochuan said in a Caixin interview that claimed that everything was fine and there was no basis for continued CNY devaluation. In response, CNYUSD rallied by 4.5% on Monday, which was the biggest move since 2005. What's the real story? How serious is the capital flight problem in China and what's the likelihood of a major Chinese devaluation? Update schedule: I generally update model readings on my site on weekends and tweet any changes during the week at @humblestudent. In the past few weeks, I have heard from many worried investors and traders as stock prices fell. These difficult period illustrate the need for an investment process. 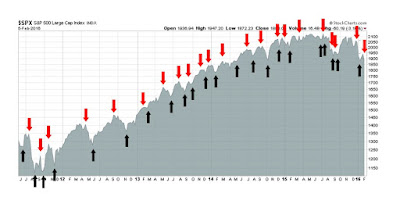 In bull phases, no one needs a process because the market is rising, When the market declines, however, investors and traders need to have laid out a decision process that details an analytical framework of what to do ahead of time. Otherwise, they wind up panicking because they either under or over-react to the bear story du jour. In the current case, the bear story du jour description is apt because there is no clear fundamental reason why the stock prices are falling (see the different explanations advanced in this Reuters story, What`s behind the global stock market selloff?). This decline began over concerns about falling oil prices and their possible effects on junk bonds, then it was China, then the excuse of the day became worries about European banks...and so on. Don`t get me wrong. There are some very valid reasons to de-risk a portfolio, but unless you have laid out the proper analytical framework ahead of time, you can easily get lost. A sustainable bear market needs valid fundamental and macro reasons for equity prices to retreat. That`s because, after the fast money hedge funds and nimble traders sell, the slow institutional behemoths still have to evaluate the situation and act. Institutional funds represent the Big Money. While they may not make investment shifts very often, when they do move, the fund flows are enormous, unrelenting and glacial. As an exercise, imagine being an analyst at an institution manager with $10 billion in US equity assets. Our analyst is part of the Strategy and Asset Allocation group. The Investment Committee is meeting next week to consider what to do in light of the current market turmoil. Our analyst has been asked to prepare a report and make recommendations. Last year, my Valentine's Day post was about how Facebook analyzed the behavior of who fall in love (see Falling in love, the Facebook version). This year, I thought that I would highlight the price of success for hedge fund managers. We explore the impact of limited attention on investment performance by analyzing the returns of hedge fund managers who are distracted by personal events such as marriage and divorce. We find that marriages and divorces are associated with significantly lower fund alpha, during the six-month period surrounding the event and for up to two years after the event. Relative to the pre-event window, fund alpha falls by an annualized 8.50 percent during a marriage and 7.39 percent during a divorce. Busy fund managers who manage larger funds and engage in high tempo investment strategies are more affected by marriage. Fund managers who depend on interpersonal relationships in their investment strategies are more affected by divorce. We show that behavioral biases may partially explain the connection between inattention and performance deterioration. The difference between the proportion of gains realized and the proportion of losses realized widens during a marriage and a divorce, indicating that inattentive hedge fund managers are more prone to the disposition effect. Taken together, our findings suggest that limited investor attention can hurt the investment performance of professional money managers. To be successful, hedge fund managers should consider staying away from personal relationships, any of them. Ah, the price of success! In theory, stock prices should be poised to rally. The SPX is testing a key support zone dating back to October 2014 and it is experiencing positive divergences on the 5 and 14 day RSI. If it did bottom here, the initial target would be the first Fibonacci retracement level at about 1935, with further resistance at about 1975 and 2010. The bulls are set up for some short-term disappointment. I wrote on Sunday that I expected further stock market weakness ahead for this week because momentum was weak and readings were not oversold (see Waiting for the market to heal). Monday's market action did not disappoint that forecast. The omens were positive for for a bullish reversal on Wednesday. Overnight, the shares of Deutsche Bank soared on a rumor of a buyback of its senior debt as a demonstration of its balance sheet strength and European bourses rallied in sympathy. At one point, ES futures were up over 1% in the overnight market. By the time the dust settled at Wednesday's close, the SPX was flat on the day. During periods of market turmoil like the one we are experiencing, it's important to keep your eye on the ball and not to get overly distracted. If I had to just had to watch just one thing, it would be how forward 12-month EPS are evolving. That's because Ed Yardeni found that forward EPS is highly correlated with coincidental economic indicators. In that context, the current market weakness makes sense because what`s really bothering the market is a lack of growth. If the growth outlook were to improve, stock prices would stabilize and start rising again. The chart below shows the latest update from John Butters of Factset. 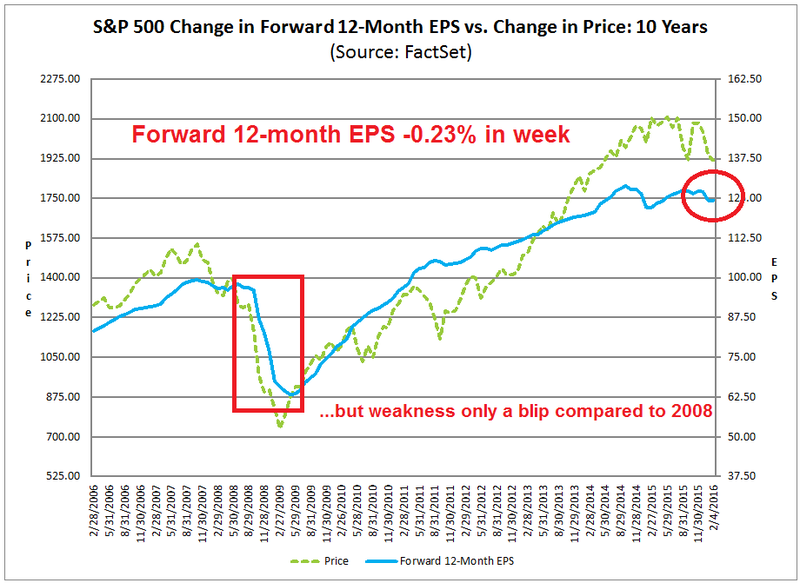 Consensus forward EPS still looks a bit wobbly, but its weakness is nothing like the 2008 bear market (annotations in red are mine). Before you write me about how annual or quarterly EPS estimates are falling as a way of bolstering the bear case, this analysis from Ed Yardeni shows that EPS estimates for any single fiscal year tend to start high and decline over time. The way to normalize the falling estimate effect is to calculate a continuous forward 12-month EPS, which is far more stable. 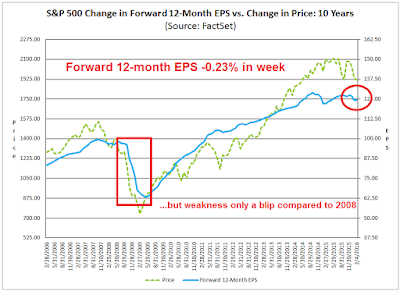 If you don`t have access to a database with consensus EPS estimates to calculate an aggregate forward 12-month EPS, you can get it from Factset. Unfortunately, Factset only updates their estimates weekly on Fridays. If you are impatient, there are a number of ways of monitoring how growth expectations are changing in real-time. Despite the recent recession scare that's been spooking markets, I have been saying for the past few weeks that disciplined macro and fundamental analysis do not support a recession call (see Bottomed, but wait for a re-test of the lows). So equities should rise in the absence of a recession, right? Wrong! From a macro and fundamental perspective, much damage has been done to risk appetite by the recent episode of industrial weakness in the US. In parallel, we have also seen a lot of technical damage in the charts. 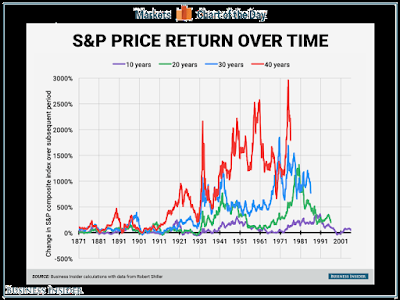 The market needs time to heal before stock prices can rise again in a sustainable way. Is the Fed tightening too much? 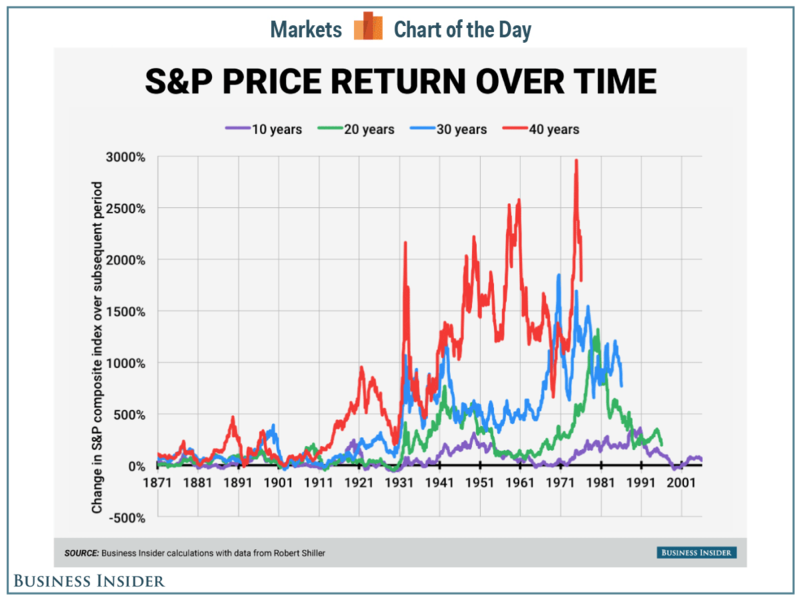 Regular readers will know that I have been relatively constructive about stock prices longer term, though I am bracing for further short-term volatility. However, the level of anxiety among my readers is high and I have had to play a game of whack-a-mole with bearish themes (as an example see Why China won't blow up the world (this year)). 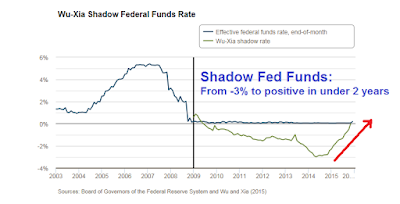 One of the more recent explanations for the current bout of stock market weakness is that the Federal Reserve is engineering an extraordinary level of tightening, as measured by the Shadow Fund Funds rate (SFF). Such Fed action, it is said, is creating a high degree of stress in the financial markets and causing stocks to tank and risk appetites to shrink (annotations are mine). How concerned should we be about this development? I had a response to my last blog post in which I indicated that the contagion effects from a China slowdown had been contained (see Bottomed, but wait for a re-test of the lows). 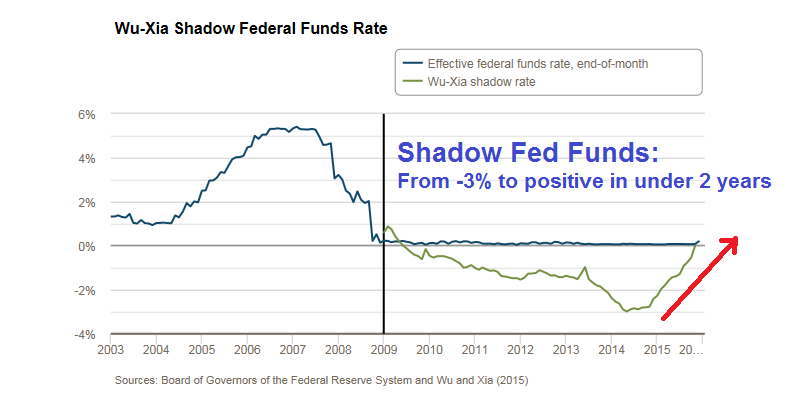 A reader pointed to comments by Worth Wray worried aloud about the possible catastrophic of a RMB devaluation. While I had initially dismissed Wray as a permabear, the combination of these concerns and a report of further weakness from China's Manufacturing PMI meant that these concerns deserve a more complete and detailed answer. Let me be clear. I don't deny that China faces many problems because of its stalling economic growth rate. Despite all of the hand wringing by western observers, however, Beijing has many tools at its disposal to mitigate the immediate downside risks facing China and the global economy. The China growth story will probably not end well, but it will not end today.